Sewn With Grace: Happy Dance! I'm doing a happy dance! A vintage featherweight Singer sewing machine has found it's way to my house. She is just a wee little thing, weighing in at 11 pounds. I have been wanting one for a long time and when I saw that Donna had one for sale, I asked my husband for an early wedding anniversary gift (next month). She was made in 1948 and belonged to a Ministers wife who sewed her clothes on it when she was in college. Some history for you…around 2.5 million were manufactured from 1933 to 1964 in Elizabethport, New Jersey; Clydebank, Scotland; and St. John's, Canada. I have not turned her on yet as she just arrived yesterday. Sweet Donna also sent along a fabric gift. Wonderful prints from Atsuko Matsuyama 30's collection. Be still my heart! Flower Sugar and 30's collection are my two all time favorite fabric lines. My heart is so full today! Congratulations, use her a lot! I've been wanting one also! I love that fabric too! She looks gorgeous! You will use her a bunch for many years to come. I have one of the light green ones and I adore her. Congratulations! What a wonderful gift from your husband! And I L♥ve that fabric. Sweet! You are going to love her. One thing I would suggest is to get a 1/4" foot with a guard. The foot that comes with it is 1/8". The one with the guard works like a dream :-) Enjoy! Thanks for telling me about that! I will certainly be getting one! What a great gift. I love sewing on mine and its wonderful to take on road trips. Try are real workhorses. Happy for you! Wonderful gift. I love vintage sewing machines and "things". Love the fabrics. Hi Renee. I am so glad she got there safely and you like the fabrics. Hope you love her as much as I love mine. Congratulations on acquiring your Featherweight. My sister-in-law sewed her wedding gown on hers in 1956. I was lucky enough to wear the same gown two years later for my own wedding. She still does all her sewing on the same machine. I hope she never gets rid of it. Congratulations! The ladies were just talking about this machine at our Quilt guild meeting last week. Enjoy!! Congratulation on your wonderful new machine. It looks so shiny and in really great condition. 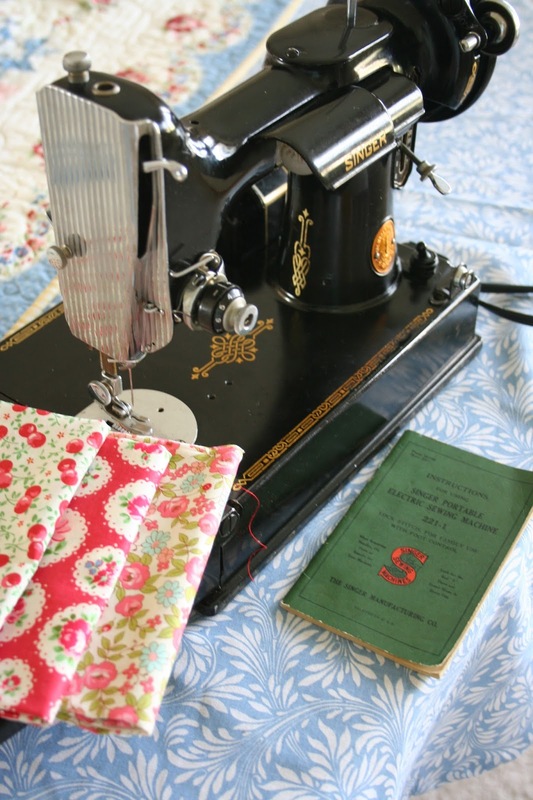 You will love using this machine, especially when you need to sew somewhere besides at home. Happy early Anniversary! What a special gift! Gorgeous. I'd be doing the happy dance too! I am so happy to see this sweet machine go to your home. And your pretty fabrics! Such a perfect gift for you. You will love sewing with it. It is a beautiful little machine.